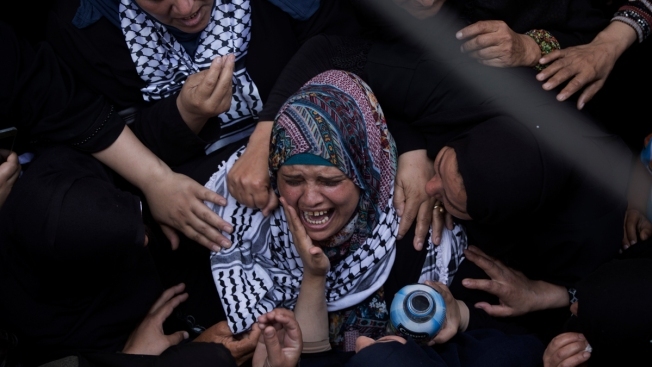 Relatives of Palestinian volunteer paramedic Razan Najjar, 21, mourn at the family house during her funeral in town of Khan Younis, southern Gaza Strip, Saturday, June 2, 2018. Najjar was killed by Israeli fire Friday during mass protests in the Gaza Strip, the Palestinian Health Ministry said. Israel's Iron Done defense system intercepted some and others landed in Gaza. Sirens wailed in southern Israel overnight warning of incoming rockets. No one was hurt on either side. Neither side appears interested in a full-blown conflict, and both exercised restraint. Militants in Gaza did not fire long-range rockets at Israel's major cities, as they did in 2014, and Israeli airstrikes were focused on unmanned military targets.